As we described in the introduction to this section, genes are very often controlled by extracellular signals—in the case of bacteria, this typically means molecules present in the growth medium. These signals are communicated to genes by regulatory proteins, which come in two types: positive regulators, or activators; and negative regulators, or repressors. Typically these regulators are DNA-binding proteins that recognize specific sites at or near the genes they control. 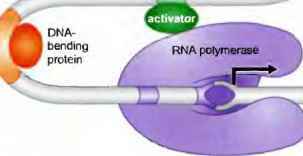 An activator increases transcription of the regulated gene; repressors decrease or eliminate that transcription. How do these regulators work? Recall the steps in transcription initiation described in Chapter 12 (see Figure 12-3). First, RNA polymerase binds to the promoter in a closed complex (in which the DNA strands remain together). The polymerase-promoter complex then undergoes a transition to an open complex in which the DNA at the start site of transcription la tin wound and the polymerase is positioned to initiate transcription. This is followed by promoter escape the step in which polymerase leaves the promoter and starts transcribing. Which steps are stimulated by activators and inhibited by repressors? That depends on the promoter and regulators in question. We consider two general cases, outlined under the next two headings. At many promoters, in the absence of regulatory proteins, RNA polymerase binds only weakly. This is because one or more of the promoter elements discussed above is absent or imperfect. When polymerase does occasionally bind, however, it spontaneously undergoes a transition to the open complex and initiates transcription. This gives a low level of constitutive expression called the basal level. Binding of RNA polymerase is the rate limiting step in this case (Figure lb-la). To control expression from such a promoter, a repressor need only bind to a site overlapping the region bound by polymerase. In that way, the repressor blocks polymerase binding to the promoter, thereby preventing transcription (Figure 16-lb), although it is important to note that repression can work in other ways as well. The site on DNA where a repressor binds is called an operator. activated level of transcription spontaneous isomer ization leading to activator uses one surface to bind to a site on the DNA near the promoter; with another surface, the activator simultaneously interacts with RNA polymerase, bringing the enzyme to the promoter (Figure 16-lc). This mechanism, often called recruitment, is an example of cooperative binding of proteins to DNA (see Chapter 5], The interactions between the activator and polymerase, and between activator and DNA, serve merely "adhesive" roles; the enzyme is active end the activator simply brings it to the nearby promoter. Once there, it spontaneously isomerizes to the open complex and initiates transcription. The lac genes otE. coif are transcribed from a promoter that is regulated by an activator and a repressor working in the simple ways just outlined. We will describe this case in detail later in the chapter. Not all promoters are limited in the same way. Thus, consider a promoter at the other extreme from that described above. In this case, RNA polymerase binds efficiently unaided and forms a stable closed complex. But that closed complex does not spontaneously undergo transition to the open complex (Figure 16-2a]. At this promoter, an activator must stimulate the transition from closed to open complex, since that transition is the rate-limiting step. Activators that stimulate this kind of promoter work by triggering a conformational change in either RNA polymerase or DNA. That is, they interact with the stable closed complex and induce a conformational change that causes transition to the open complex (Figure 16-2b), This mechanism is an example of allostery. FIGURE 16-2 Allosterrc activation of RNA polymerase, (a) Binding of RNA polymerase to the promoter tn a stable closed complex, (b) The activator interacts with polymerase to trigger transition to the open complex and high levels of transcription, ibe representations of the dosed and open complexes are shown only diagrammatical^ for a more complete description of those States see Chapter 12. RNA polymerase activated leve! of transcription transition to the open complex, in the other example (at the merT promoter), the activator (MerR) achieves the same effect hut does so by inducing a conformational change in the promoter DNA. There are variations on these themes: some promoters are inefficient at more than one step and can be activated by more than one mechanism. Also, repressors can work in ways other than just blocking the binding of RNA polymerase. For example, some repressors inhibit transition to the open complex, or promoter escape. We will consider examples of these later in the chapter. Thus far we have tacitly assumed that DNA-binding proteins that interact with each other bind to adjacent sites (for example, RNA polymerase and octivator in Figures 16-1 and 16-2). Often this is the case. But some proteins interact with each other even when bound to sites well separated on the DNA. To accommodate this interaction, the DNA between the sites loops out, bringing the sites into proximity with one another (Figure 16-3). We will encounter examples of this kind of interaction in bacteria. Indeed, one of the activators we have already mentioned (NtrC) activates "from a distance": its binding sites are normally located about 150 bp upstream of the promoter, and the activator works even when those sites are placed further away (a kb or more). Wr wilt also consider repressors that interact to form loops of up to 3 kb. In the next chapter—-on enkaryotic gene regulation— we will be faced with more numerous and more dramatic examples of this "action at a distance." One way to help bring distant DNA sites closcr together (and so help looping) is the binding of other proteins to sequences between those sites. In bacteria there are cases in which a protein binds between an activator binding site and the promoter and helps the activator interact with polymerase by bending the DNA (Figure 16-4). Such "architectural" proteins facilitate interactions between proteins in other processes as well (for example, site-specific recombination; see Chapter 11). FIGURE ! 6-3 Interact! ons between proteins bound to ONA. (a) Cooperative binding of proteins to adjacent sites, (b) Cooperative binding of proteins to separated sites. FIGURE 16-4 DNA-bending protein can facilitate interaction between DNA-binding proteins. A protein that bend", DNA binds to a site between the activator binding site and the promoter. This brings the two sites closer together in space and thereby helps the interaction between the DNA bound activator and polymerase. We have already pointed out that gene activation can be mediated by simple cooperative binding: the activator interacts simultaneously with DNA and with polymerase and so recruits the enzyme to the promoter. And we have described how activation can, in other cases, to mediated by allosteric events: an activator interacts with polymerase already bound to the promoter and, by inducing a conformational change in the enzyme or the promoter, stimulates transcription initiation. Both cooperative binding and a hosiery have additional roles in gene regulation as well. For example, groups of regulators often bind DNA cooperatively, That is, two or more activators and/or repressors interact with each other and with DNA, and thereby help each other bind near a gene they all regulate. As we will see, this kind of interaction can produce sensitive switches that allow a gene to go from completely off to fully on in response to only small changes in conditions. Cooperative binding of activators can also serve to integrate signal«; that is, some genes are activated only when multiple signals (and thus multiple regulators] are simultaneously present. A particularly striking and well-understood example of cooperativity in gene regulation is provided by bacteriophage We consider the basic mechanism and consequences of cooperative binding in more detail when we discuss thai example later in the chapter, and also in Box 16-5. Allostery, for its part, is not only 0 mechanism of gene activation, it is also often Ihe way regulators are controlled by their specific signals. Thus, a typical bacterial regulator can adopt two conformations—in one it can bind DNA; in the other it cannot. Binding of a Signal molecule locks the regulatory protein in one or another conformation, thereby determining whether or not it can act. 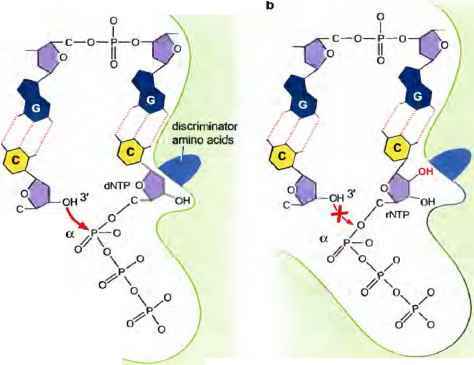 We saw an example of this in Chapter 5 (Figure 5-25}, where we also considered the basic mechanism of allostery in some detail; in this and the next chapter we will see several examples of allosterir control of regulators by their signals. As stated at the beginning of this chapter, the bulk of gene regulation takes place at the initiation of transcription. This is true in eukaryotos just as it is in bacteria. But regulation is certainly not restricted to that step in either class of organism. In this chapter we will see examples, in bacteria, of gene regulation that involve transcriptional elongation, RNA processing, and translation of the mRNA into protein.